California shop owner served in leadership positions on numerous state and national collision repair organizations. On Saturday February 2, John “Jack” Caldwell passed away at the age of 85 years old. Caldwell is survived by three children, Kevin. Kerry, Kelly, six grandchildren, and five great grandchildren. 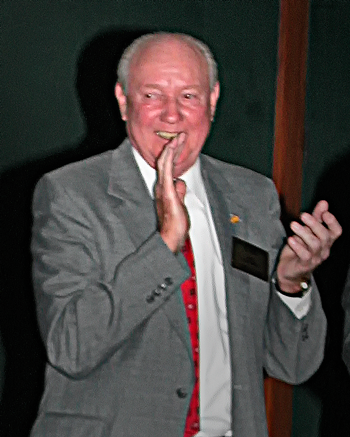 Jack Caldwell, seen here during the 2002 Collision Industry Night of Achievement, passed away February 2 at 85 years old. Caldwell served in leadership positions on several collision industry organizations. Caldwell was the founder of Autobody by Caldwell in Laguna Hills, Calif. in the 1970s. Caldwell helped found and served in leadership positions on numerous local, state and national collision industry organizations during his long career in the collision industry. Caldwell served as president of the Orange County Chapter of the California Autobody Association (CAA) and in 1984 served as president of the statewide organization. He was one of the small group of collision repairers that participated in the first meetings of what eventually became the Collision Industry Conference (CIC). Caldwell served as chair of the conference in 1986 and was an active participant in CIC for many years. He also served many years on the Automotive Service Association (ASA) operations committee ascending to the position of Collision Division Chairman. He also was elected chair of the NACE trade show. Throughout this time he participated in many trade advisory panels including ASE, I-CAR, Motor, Mitchell and ADP. Caldwell was a 1991 inductee to the Hall of Eagles, the collision industry’s Hall of Fame. Jack was born in Cleveland, Ohio on April 14, 1933 and moved to California nine years later. He received his Bachelor’s degree in Biology from Loyola University in Los Angeles while working and owning his own auto body repair shop. From there he entered the United States Air Force earning his wings by racking up over 1000 hours as a B-25 bomber pilot, achieving his jet rating while earning his instructor qualifications and ultimately securing a commercial aviation license. After being honorably discharged as a Captain he went into the corporate world in aluminum sales rising to Vice President before going back to his first passion of a collision repair professional as owner of Autobody by Caldwell Inc. for 30 years. He additionally had served as a president of the Jaycees national organization and was instrumental in their seat belt installation programs in the mid 1960’s. He also had a passion for visiting Kauai, Hawaii where he and his wife spent much of their time and served on multiple boards of directors for their property on the island. Services will be held 11:00 a.m. Friday, February 8 at the O’Connor Mortuary, 25301 Alicia Parkway, Laguna Hills, Calif. followed by internment at 12:30 p.m. at El Toro Cemetery, 25751 Trabuco Road in Lake Forest. A man of great knowledge and a founder of our industry. May we conduct ourselves according so he may rest in peace. Jack was the kind of guy everyone should have had as a mentor in life. He always looked on the positive side of things, but he was never afraid to speak up about issues he felt were detrimental to the industry. Jack and his wife Vivian were a couple that truly brought class to this industry in a time when we were seeking to be recognized as businessmen and women. If there was an effort to help improve this industry, Jack was surely a part of it from the beginning. I just wish more folks in our industry could have had the ability to have known Jack and to have benefitted from his advice and mentorship. We have truly lost a “genuine nice guy”. You go guy, great job, rest well, and Thank You..